The proposed changes to how countries qualify for Olympic places is a big deal. One recent response emphasised the cost savings that can be generated from having Olympic qualifying by region, instead at the World Championships. I read your post about Continental qualifiers – interesting but I don’t interpret ISAF’s intentions in the same way. ISAF Olympic Commission suggests reducing the number of places available through the Sailing World Championships from 75% to 50% and instead of the remaining places coming through World Championships, getting them through Continental Championships, to make them more accessible. In the current quad, Canada has to qualify by sending teams to Australia, or failing that to Europe. Same applies to Asia, Africa, and South America. 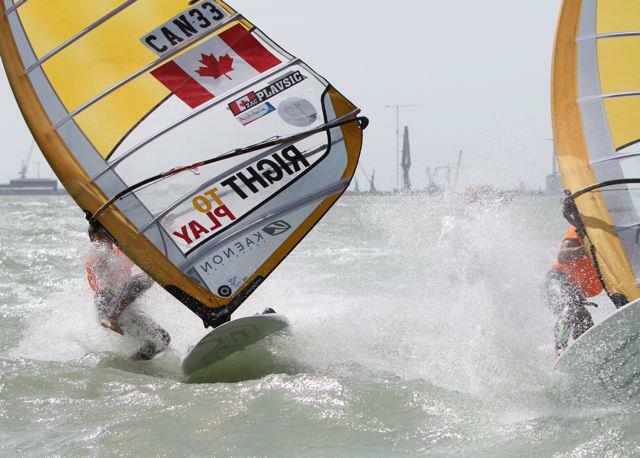 ISAF merely suggests changing the second chance to a Continental event which would reduce the costs. Having read through the report on ISAF’s Intentions, it is easy to see the well intended nature of the proposal. Unfortunately, the cold hard facts only support a change in 3 of the medals, the laser/radial and RS:X men. With modest alterations, a 4th, the Women’s RS:X can easily be added to that list. In order to have 6 or 7 classes participate, quite drastic changes need to be made in the next few months. I agree with the response above except for ‘merely suggests changing the second chance.’ As a sailor who ‘merely dedicated a decade of life to going fast in circles’, I think it’s pretty darn important that the sailors decide these things on the water in a fair manner. As the analysis below shows, within the current system that second chance can’t be allocated by continent and still be fair for teams of the world fighting for their shot! It comes down to the strength of the ‘big’ sailing nations, the limited number of athletes invited to the games, and the allocation of so many medals to shallow Olympic fleets. Then there are the countries who send very full teams: NZ, Brazil, Netherlands, Canada, China, Austria, Finland, Sweden – 8 – there are more, I just don’t want to pollute the analysis even further. So there – you’ve got 16 places taken up with the same 16 countries…. not every time, but most of the time… That’s 160 boats going to 16 countries, pretty much… so lets see how the table looks for continental qualification with the real world taken into effect. This list illustrates where the opportunities lie for diversification. 4 of the ten classes are wholly unsuitable as there’s very limited room for diverse nations. Further, I’d argue that there is very limited opportunity in the 470 men, Finn, and RSX:Women as so few remaining spot make them unsuited for continental qualifiers either. Once you average less than 2 spots per continent, that will likely leave some deserving sailor on their sideline, ‘merely’ because their nation borders their buddies nation. Even assigning 2 spots per continent will surely leave deserving athletes out from some continents while including lesser teams, yet will not contribute to diversity as either team would have contributed to diversity. So that leaves us with lasers, radials, and RS:X men where there is a fair way to put in place continental qualifiers for Olympics spots. Doing so in these three classes would lower the cost of competing and bring greater importance to continental events, the stated goal of this program. There is little downside that I can see. The elite sailors will head off to compete at the world championships anyway, the also-rans will have more money in their pockets, and the quality of both qualifying competitions and the Olympics will be high. What ISAF should be asking is, IS THIS ENOUGH? The answer has to be no! Making the 3 cheaper classes slightly cheaper will in no way reform sailing and will not nor should not satisfy the IOC. So what can we do… It takes a depth of Olympic participation by fleet to make continental qualifiers a viable option – allowing both high quality competition with a fair rate of inclusion for teams outside the core nations. So there are somethings we can do in RIO and beyond to allow for continental qualifiers to be fair. If Continental Qualifiers are the avenue sailing chooses to improve our lot, this is what it should look like in 2016. By trading down the doublehanded places to increase our ‘diversity’ classes, we can hold continental qualifiers in the 4 already cheap classes for the 2016 quad. To further emphasize my points about needed depth to have quality continental qualifiers, this is exactly what Canada did for the classes where there is strength and depth in their continent. The Canadian Athlete Development Committee knew that the lasers and radials would qualify the county in Perth. So, instead of sending all the eligible athletes to Europe for the 2nd qualifyier to choose who would get the spot, Canada instead used MOCR as a continental qualifier. Because that strength and depth is not apparent in any of the other classes in North America, all the other classes do have their Canadian selection regattas in Europe. This kind of format would make most of the classes viable for the continental qualifier system. Kitesurfing gets added to show off the X-games potential of being on water with wind and waves. It comes at the expense of the 470, a boat that rewards the classic skills we all grew up learning were important, a painful concession for sailing. The change isn’t necessary because the 470 isn’t good racing (full disclosure I’m a 49er sailor so can’t contemplate the reverse…) but mostly because with the ISAF squeeze on athlete numbers two in a boat keeps getting harder to justify. As a side note, when the Star lobby pushes for the 11th medal again, see if you can get some athlete spots too, otherwise you’re just holding up the move to continental qualifiers even more. In conclusion, if ISAF is going to put diversity as a high priority by shifting the core of the sport as it stands today, they are going to have to be thorough in the process. It is not enough to blow up the World Cup circuit and haphazardly assign places to continents. All aspects of the Olympics must be aligned with the goal of diversity if a shift can be made successful. In the mean time, ISAF should begin the process of continental qualifiers for 2016 in 4 classes. That should give everyone a chance to get used to the idea before making a full shift in 2020.